Every one of your customers has a unique story waiting to be told – let’s capture it! New chapters are created every day through the conversations of your customers as they attest to the real-world impact of your solutions. Referential is your one-stop shop for capturing the experiences of your customers and leveraging their testimony to tell unique, authentic stories of who they are and the genuine value your company brings. Our Storytelling Studio crafts rich content that is faithful to the real-life experiences of your clients, celebratory of the tangible difference your solutions make, and highly effective at transforming undecided prospects into enthusiastic customers. Tried and true, the written word will always be a core tenet of human communication. There are countless perspectives that define each story. 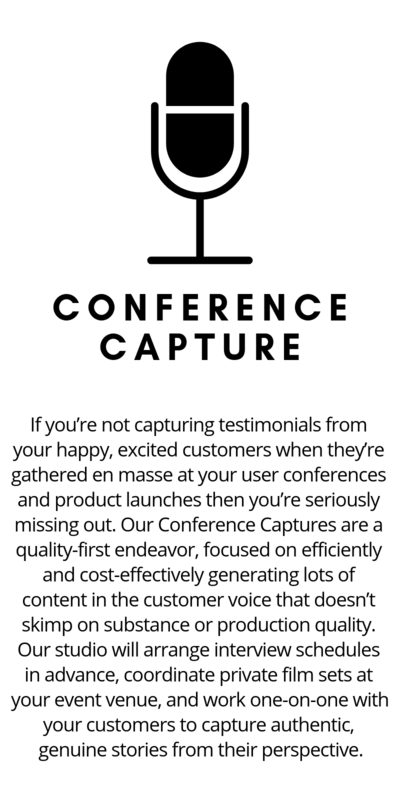 Capture your customers’ experiences and memorialize their story forever. Video has stolen the attention of a generation and likely, many more to come. Capture the moment through the creative use of sound, design, and film and ensure a story is never forgotten. Metrics, the most underrated storytelling tool of our time. Data visualization is the missing dimension to your story you never knew you needed. Your impact is powerful and important; make sure people know it.